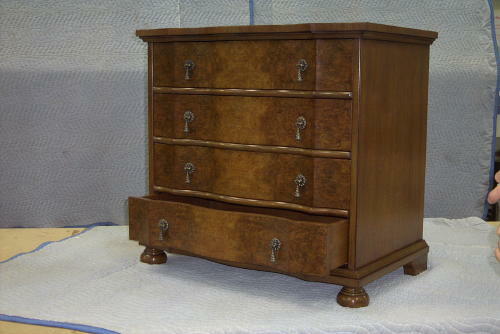 We built this piece of furniture to match a dresser that was not available in a night stand size. Our customer wanted a night stand that would match the dresser they already had, so we were commissioned to build exactly that. The back of the cabinet has a media chase. We incorporated this feature in to accomodate the top drawer, which houses a pull out DVD player. Electrical and media cords enter and exit the cabinet from the bottom side rather than the back. 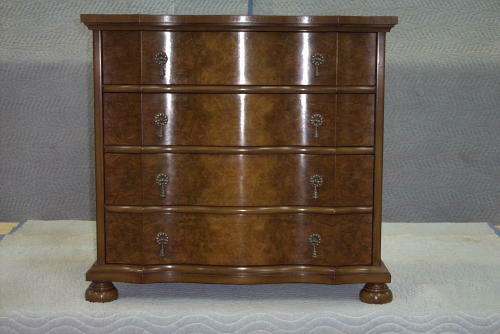 The drawer faces are balance matched Walnut Burl and so is the top. The sides and back are plain Walnut. This was alot of fun to build.